There's a new image on the front page of the Carolina Hurricanes' official web site teasing the unveiling event for their new third jersey next week. The image and story link to the same article I wrote about yesterday. The only thing I found interesting was this new image. What I'm interested in is whether they're actually going to use a black and white version of their primary logo as a shoulder patch on the new sweater or this is just a stylized/greyscaled photo. The white circle in the center of the logo makes me think the logo will be black and white. Personally, I'd be a big fan of a clean, black and white logo. I'm not sure any other team has actually changed the colors of their logo for a third jersey. Someone correct me if I'm wrong. 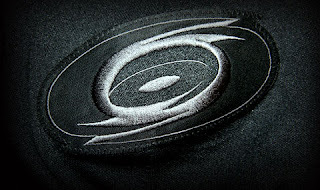 For reference, the Hurricanes will unveil their new third jersey to media and fans at a news conference on Wednesday, September 10. I'll post photos here as soon as they're available.